This article is about the final castle in Super Mario World 2: Yoshi's Island. For the place, see Bowser's Castle. For the level in Yoshi's Woolly World, see King Bowser's Castle (Yoshi's Woolly World). King Bowser's Castle is the final main level in Super Mario World 2: Yoshi's Island and Yoshi's Island: Super Mario Advance 3. 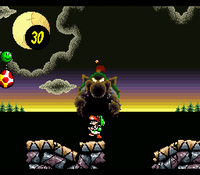 When Yoshi starts the level, he is in an outdoor fortress area with a huge moon, hills and skinny trees in the background. He then needs to cross a long gap as the Helicopter. Along the way, Yoshi must avoid the Skeleton Goonies; crashing into them causes him to fall (usually leading to losing a life). Kamek also occasionally flies in during this time, trying to knock Yoshi out of the sky. If Yoshi makes it to the Yoshi Block (followed by a Middle Ring), Kamek will fly in for the last time in the area and look at Yoshi grimly. The hallway inside the castle consists of four areas to choose from (doors on a roulette wheel). 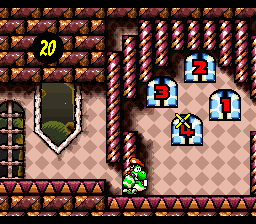 Four doors which are numbered 1, 2, 3 and 4 spin on the wheel, and Yoshi must hit one with a Yoshi Egg, which will then drop to the floor and allow him to progress. Door 1 contains Mace Guys, Ball 'N' Chains, and lava pits. Door 2 includes nearly every Shy-Guy species, and at the end of that area is a door containing a Slime, who holds the key to another door that leads to the final room. Door 3 is notable for the appearance of Tap-Tap the Golden, where he chases Yoshi through a lava-filled cave path that autoscrolls. The "Castle Boss" music plays in this area, but in the GBA version, the "Room Before Boss" music plays instead. Yoshi can knock Tap-Tap the Golden back and into a pit with eggs, buying him some time. Tap-Tap the Golden will eventually reappear on screen, however. Eventually, Yoshi will reach a Warp Pipe to get away from him. Door 4 consists mostly of moving platforms that hold Coins (being a coin path where the player can get a lot of extra lives). The only possible threats are a few Gusties that fly through the stage and two Fly Guys at the end who carry 1-Ups. All four areas lead to the final room, where the "Room Before Boss" music plays. The final room before the boss battle is an autoscrolling playroom. 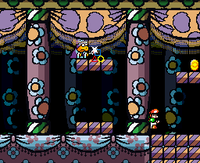 Kamek appears here and attempts to attack Yoshi with his magic wand. If Kamek hits any of the blocks in the level, they will turn into a Fang, a Milde, a Shy-Guy, or a star. If Yoshi makes it past Kamek's final shots, he will be awarded with a Middle Ring and a huge door that leads to Baby Bowser's room. Kamek greets Yoshi, demanding he hand over Baby Mario. Soon, however, Baby Bowser awakens, aggravated that Kamek "woke" him. He then repeatedly Ground Pounds Kamek and kicks him aside, before noticing Yoshi and acknowledging him as a "gween donkey". He attacks Yoshi, trying to push Baby Mario off and ride Yoshi. Yoshi must dodge Baby Bowser's Ground Pounds and Ground Pound the floor himself, creating a shockwave that can damage the young Koopa King. Yoshi and the gigantic Baby Bowser are seen here fighting. Thus, due to the marvelous team work of the Yoshi clan, the twins are reunited. The captured stork is freed by Yoshi, and sets about his duty and finally makes the long awaited delivery! Thank you, Yoshi! The twins will meet the parents soon! The Stork can then make his delivery to Baby Mario and Luigi's mother and father, and the credits roll. Iyoiyo Kuppa Jō Da At Last, it's Bowser's Castle! Le Château de Bowser !! (Yoshi's Island : Super Mario Advance 3) Literally "Bowser !! Finally and already !!" Chōng xiàng Kùbàwáng chéngbǎo! Storming Bowser's Castle! This page was last edited on April 10, 2019, at 12:59.